PRODUCT: Zurn Z125 8-3/8 inch Diameter Roof Drain, Dura-Coated Cast Iron Body with 4-1/4 inch high Low-Silhouette Poly Dome and Combination Membrane Flashing Clamp/Gravel Guard, 2 inch Pipe Size outlet. Price/Each. Outlets: Available in 2, 3, 4" outlets with No-Hub and threaded. Domes: Aluminum dome (ZA), Bronze Dome (ZRB), Cast Iron (-ZC)vandal proof kits. Bearing Pans/sump receivers and under deck clamps are optional. Zurn #56586 Z125 8 inch Cast Iron Replacement Drain Dome (acutual size is 7-1/2 OD x 4-3/8 High). Price/Each. 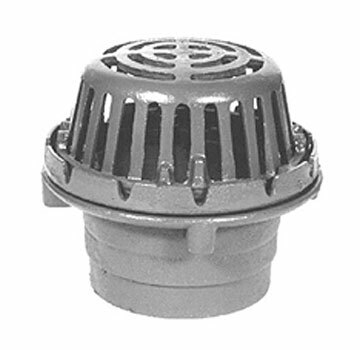 Zurn Z125 8 inch Replacement POLY Drain Dome (actual size is 7-1/2 OD x 4-3/8 High). Price/Each. ZURN #66373 Top-set deck plate for Z125 8 inch drain. Price/Each.